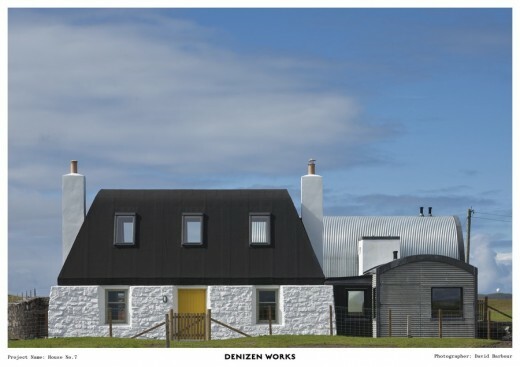 Contemporary Architecture in Western Scotland – design by Roots Architecture Ltd.
Design: Architects / Designers at Tog Studio ; Roots Architecture Ltd. 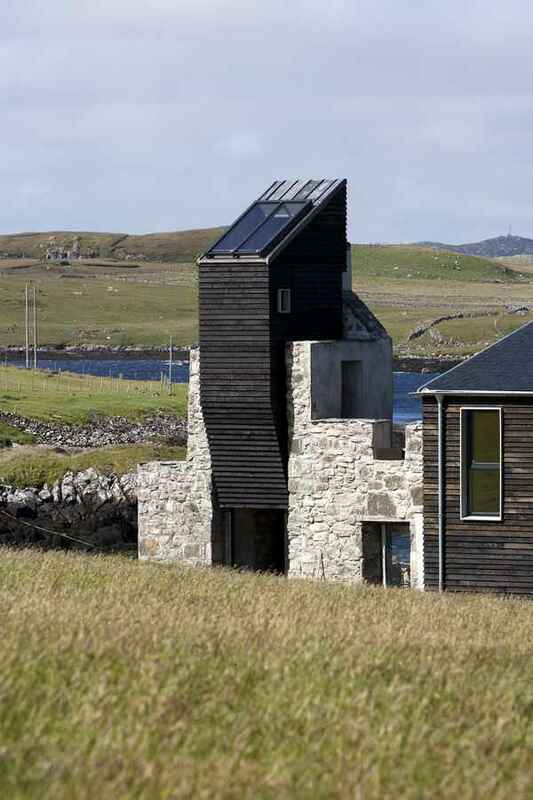 The project recently won a design award in the Small Projects category at the GIA Awards in Glasgow. 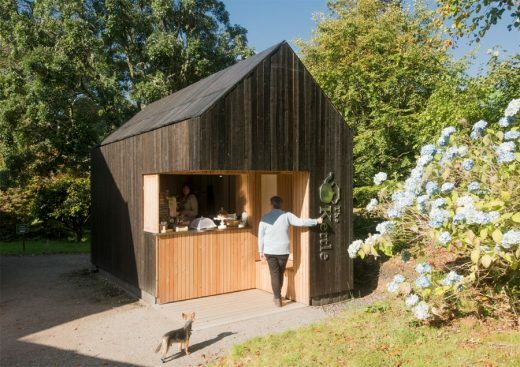 ‘The Kettle’ cafe-kiosk in Dunollie Museum, Castle and Grounds is the most structurally ambitious live-build project delivered during Tog Studio, an intensive ten-day summer school led by architecture and engineering graduates. ‘The Kettle’ combines traditional joinery and digital fabrication to deliver a contemporary yet subtle addition to the Estate. 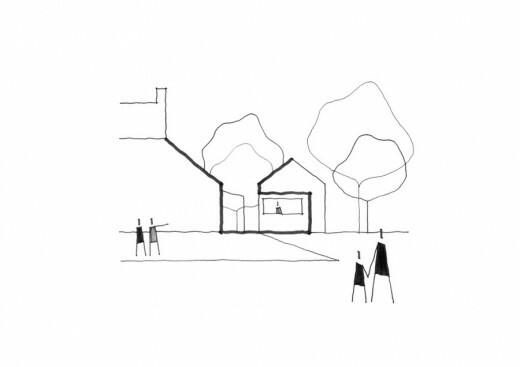 ‘The Kettle’ references the traditional forms of the adjacent 1745 house, incorporating a distinctive dualpitched roof that sits comfortably within the historic setting. 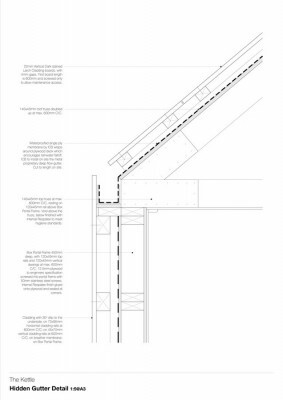 Diligent consideration has been paid to the detailing to ensure the cladding extends seamlessly between wall and roof to establish a strong uninterrupted facade. 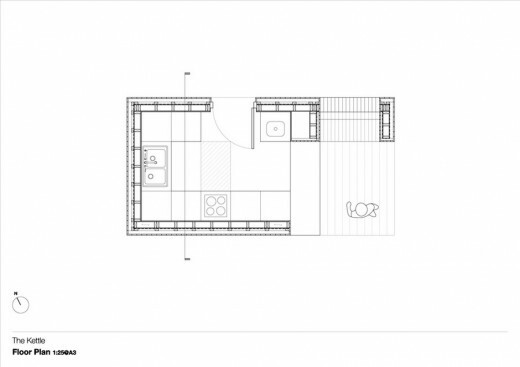 The serving space flows seamlessly into the garden by means of a theatrical cantilevered corner that opens the counter and seating nook to views of the Estate grounds. 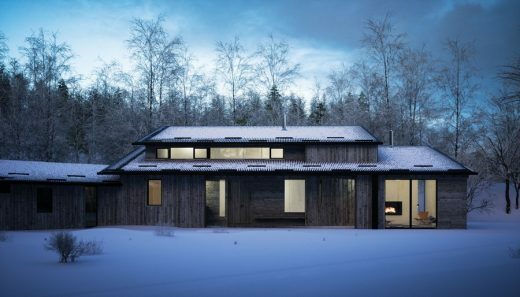 ‘The Kettle’ was designed to make the most efficient use of C16 structural timber and showcases the attractive qualities of a natural, zero carbon material. Local volunteers and Tog participants, keen to learn new skills, were pivotal in the construction of ‘The Kettle’. 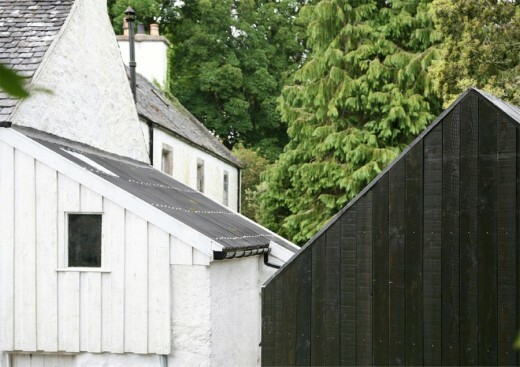 Clad in blackened larch, the exterior nods to the black kettle that founded the museum’s collection, whilst connecting the building to the surrounding woodland. The contrasting material palette of wide black exterior boards and narrow blonde larch interior cladding accentuates the cut-away corner, breaking through the blackened outer skin of the building to expose a welcoming sanctuary where visitors can shelter. The interior of ‘The Kettle’ houses a well-equipped kitchen where Victorian delicacies are baked to compliment the visitor experience of the museum’s collection. The stainless steel counter wraps around the open servery and provides a display space for the day’s baking. Large timber shutters, clad in blonde larch, close the servery for the evening, completing the strong, solid facade. ‘The Kettle’ is a gravitational point for the grounds, providing a social, and interactive space for locals and visitors to gather. This project has brought significant benefits to the enterprising charity that runs The Dunollie Museum, Castle and Grounds. 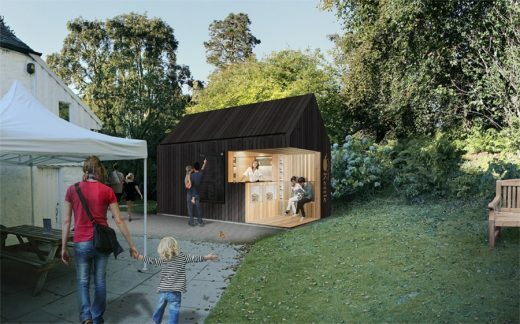 By building ‘The Kettle’ the charity have replaced an expensive rented vending trailer with an efficient and cost-effective servery that adds to the historic context. Money saved in rent can now be reinvested in maintaining the collection and estate or supporting the on-going programme of activities for the public. 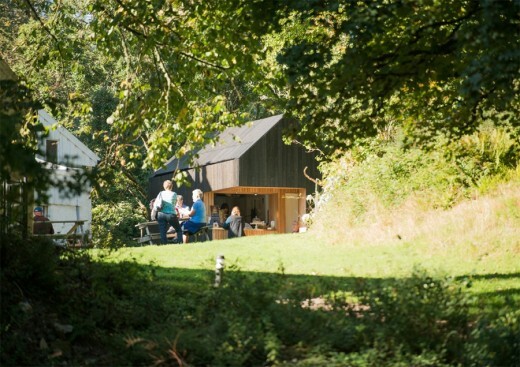 The dynamic, exciting and creative blend of both the traditional and the modern has seen ‘The Kettle’ become a visitor attraction in its own right, boosting revenue and visitor numbers. 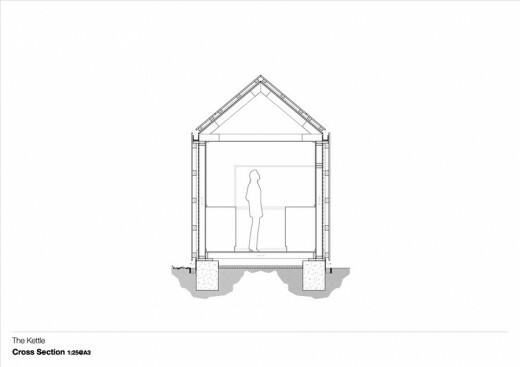 The Kettle’ cafe-kiosk Dunollie Estate images / information from Roots Architecture Ltd.